In the courtyard at no. 1, Huet Square, from the Stairs’ Tower to the Capitulary House situated at no. 13 Huet Square (double address with no. 13, Small Square) there exists a portion of 30 meters of the defense wall which is part of the first precinct, being erected in the 13th century. At the extremity towards the Ursulinelor Church, the wall forms two arcades which sustain a passage gallery towards the courtyard once named the courtyard of the monks. Nowadays this gallery makes the connection with Constitutiei Street. The Babers’ Tower existed here once, nearby the Salt Gate. The fragment of wall along Manejului Street is represented by a series of semicircular arches which were meant to sustain the guard gallery. The fragment of the fortification walls situated between the Carpenters’ Tower and the Potters’ Tower escaped the “systematization" in the 19th century. Nowadays the wall preserved its aspect from the 15th century, when it was rebuilt in bricks and equipped towards the interior with ample arcades which support the guard path. This includes a wooden parapet and a roof sustained by wooden poles. Across the Carpenters’ Tower, towards the inner part, a sort of balcony appears, the tower being placed on the exterior of the wall, flanking it. The initial firing holes of the wall are adapted to arquebuses, the bulwarks meant for bows having been modified. 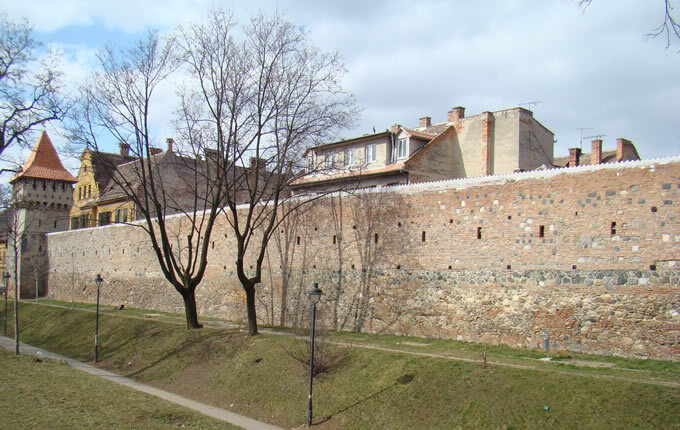 The defense wall on Centumvirilor Street, spreading between Odobescu Street and Tribunei Street, was erected between 1357-1366 and transformed in the 18th century. The section is over 200 meters long, and it is located on a wave area between the Lower Town and the Upper Town. Seen from the inside the precinct, Centumvirilor Street has a convex profile, and Konrad Haas and Odobescu streets seen from the foot of the wall have a concave profile, the two ranges uniting at the ends, which makes the elevation of the wall receive a lens shape with a maximum height of 10 meters in the middle section where the “POSCHEN" stairs were created meant to connect the two districts of the old town. The exterior defense wall, between the Haller Bastion and the fragments of the Cisnadie Gate Bastion. The last fortification belt may be admired in all its splendor along the Coposu Boulevard. A green area with trees separates the sidewalk from the wall. The green area was first arranged in 1791 between the Haller Bastion and the Thick Tower, later prolonged till Cisnadiei Bastion and is known as the promenade. At the extremity towards Unirii Square as well as near the Thick Tower, the wall is pierced by a semicircular arch which allows the access of the pedestrians. At the crossroad of Filarmonicii Street with Coposu Boulevard, a break was made into the wall in order to allow the access of vehicles. This is where the former Corpse Gate used to be situated, opened in the wall in 1554 during the plague epidemics. Across the street from the gate, where the new wing of the hospital is located nowadays, there existed a cemetery which functioned until the end of the 19th century. Between the Soldisch Bastion and Mitropoliei Street, on Ioan Lupas Street, between the Soldish Bastion and Mitropoliei Street, there exists a defense wall built at the beggining of the 17th century to connect with the Cisnadiei Bastion. The rest of the wall was demolished in 1903.